Robert King has edited more than a hundred editions of baroque and classical music for use in concerts and recordings. All have been used in professional concerts and/or recordings. They are practical, tried and tested performing editions, ideal for both professional and amateur use. Instrumental parts have sensible page turns, and continuo bass lines are fully figured (keyboard continuo realisations are mostly not supplied). Please ensure that you order enough full scores for conductor, vocal soloist(s) and keyboard player(s). If a vocal score is not listed for a certain work, singers perform from the full score. We offer substantial price reductions for bulk purchases of chorus scores so that our customers don't feel tempted to buy one copy and photocopy the rest themselves: please ask us for a quotation. Where there is a recording of a work using this edition, we give the recording catalogue number. We will advise you of the total price including postage, any applicable discounts (ie for multiple copies) and delivery times. We accept payment by Sterling cheque and by bank transfer, but 95% of our customers pay by PayPal. We aim to despatch music orders within a few days of receiving payment. 100 of the finest examples of English sacred choral music of the past five centuries, from the exceptional renaissance polyphony of Taverner, Tallis and Byrd, through Restoration composers led by Purcell, to the glorious outpouring of works by the nineteenth- and twentieth- century greats, including Wesley, Elgar, Stanford, Vaughan Williams and Howells. 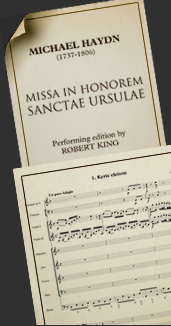 A brand new edition by Robert King of this vividly atmospheric masterpiece, with continuo parts that have sensible page turns, allowing bowed and plucked string players to perform from fully figured scores that also contain the full vocal line. Robert King’s acclaimed arrangements of Bach’s magnificent six trio sonatas for his much praised Hyperion recording (CDA66843) are now available in a fully revised edition (c.70 mins), scored for varied pairings of instruments including violins, viola, oboe, oboe d amore, viola da gamba and flutes. One of the most performed choral works of the eighteenth century, newly published by Oxford University Press, and scored for SATB choir, SATB soloists and string orchestra (or single strings) this is an ideal work for a choir looking for an eminently singable but less familiar baroque work.